Google stars as rich snippets are an effective tool for search engine optimization. Aditionally, they attract more customers so that your website will be visited more often. Effect Search engine results with stars can attract more customers and lead to higher click-through-rates. Usually, this rate will be increased up to 5%. Results with high click rates will be categorized more important from search engines. So the ranking of your website will be influenced positively. 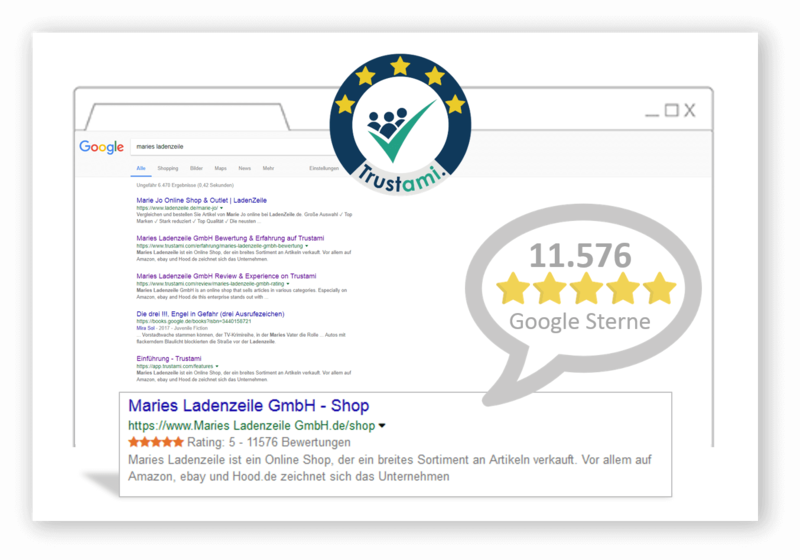 With Trustami your product and category pages will be enhanced with rating stars in the organic search engine results. Thus, your customers can see your trustworthiness even before they visit your website. Your advantage with Trustami is that we combine all your reviews and send all these information to Google. So you get the highest review number as possible in comparison to other review providers. Also, Trustami shows all your reviews, not just the reviews from the last 12 months.